Yeah, & you won’t recognize your idea anymore. As a matter of fact, it is likely that the goals engendered by your idea will have had their poles reversed. What began as a great idea for the good of the people will have become a great idea for confusing, dividing, and ultimately screwing the people. Take 3 ideas that Willie and his Masters ran across the stage this week. 1. Esprit Park — who could possibly be against adding another jewel of a park to the public domain? One member after another of the Board’s Public Health & Environment Committee praised a transfer of ownership of this little emerald island from Esprit de Corp to the city. They had me nodding & feeling warm & fuzzy about something we could all finally agree upon until that old “fly-in-the-ointment” Calvin Welch closed out the public comment part of the scam. Welch burst the bubble. The deal would actually cost the Jobs-Housing Linkage Program which funds affordable housing … $7.106 million smackers. Leveraged, noted Welch, this money could fund over 20 million dollars in affordable housing. The deal also rips off poor kids by taking a half million bucks from the Child Care Fee. What a deal for Willie and his gentrification effort. You take money away from poor people to pay for gardens in which only the rich will stroll. 2. Having trouble evicting your low-paying tenants? Under a new program presented by (but apparently totally unintelligible to) Supervisor Leland Yee, you can get cash from the city to throw the poor buggers out. City suing you because you let your tenants live in the midst of rats & mildew & sewage? The city will give you the cash to hire Robert McCarthy (he’d probably take these cases pro-bono) or Alice Barclay to defend you. You’d be surprised at what a fight such a great little program caused. A hundred grand. That’s one … fity-thousandth of the budget. They fought like it was for a billion dollars, and they were right to do so. It was yet another Willie Brown co-opt. If it’s cool to defend tenants being thrown into the streets with city money, reasoned Willie, it must be cool to fund the people tossing them out. Does this seem a little strange? Chris Daly caught on right away. “How do you define ‘low-income’ owners?” asked Daly, wanting to know if their rental income figured into it. The city attorney’s rep shrugged. For once, he didn’t know. Daly pushed Yee. Yee folded: “Jenine New of the Apartment House Association is not here,” he said, looking wildly around the audience for the lobbyist who obviously wrote the legislation. The political junkies, drunks, & groupies who populate my front room hooted. “Willie’s detectives got more than sun tan lotion on this boy!” shouted one. “Naw. … He wants Kevin Shelley’s Assembly seat,” said another. I mused. The mayor had co-opted another program. Challenged it with its mirror-opposite to confuse the issue. 3. Go to sanfranciscosentinel.com for the earliest breaking news on the San Francisco political scene. Come to the San Francisco Call for the most insightful examination of same. Murphy makes less than $800 a month and runs his site on a shoestring. The new “Willie Web” will have thousands and will doubtlessly give you the same sort of developer-slanted garbage the mayor so loves. 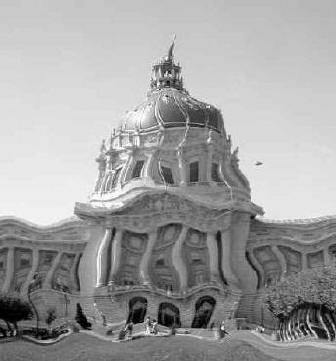 Rising from the Texas swamps like a poorly weighted body, former San Francisco Unified boss Wally Rojas slimed into City Hall this week. This guy is soooooo Brooklyn! He used every trick of the Severely Emotionally Disturbed. He turned up the volume. He denied responsibility. He threw in a massive blame-shift. He blustered and ignored all time limits and parliamentary procedure. He had not lost his edge. It’s hard to get a parliamentarian like Lakey to smile … or to stump em. Daly’s question did both. “I did spend some time as a prosecutor long ago,” offered Lakey, to some chuckles from the audience. Rojas didn’t have to swear to God, it turned out. We had to be content with watching him swear at the people of the city and county of San Francisco and their elected reps. Waddaguy. Get outta here, Wally. … Really, Wally … get … out … of … here. Gavin Newsom continues his pretense-at-superiority routine. He seldom speaks unless really big money is on the line for his yacht club buddies. He prefaced one comment sarcastically to the Board: “I’ll be brief, Mr. President, in anticipation of your admonition.” He rushes out of the chambers as quickly as possible and pretty much plays by himself in the corner while he’s there. He has visually aged a good deal in the few short months he’s had to sit between Leland Yee and Tony Hall (but, hey … who wouldn’t?). And worst? It’s only a rumor, mind you, but I understand one of the big lingerie companies has canceled plans to feature Gavin in a coming catalogue. Apparently, they want a real embodiment of brains and looks and macho power. They’re going to go with Supervisor Matt Gonzalez in a leopard skin thong swinging across a river on a vine with a large knife in his teeth And carrying a certain scantily clad assistant district attorney in his free arm. Read em & weep, Gav.